After returning home from a wedding, and in the middle of a fight, a couple is threatened by a group of random home invaders who want to terrorize and possibly murder them. Sitting at home, awake, between the late hours of the night and the early hours of the morning when the light is at its darkest, a loud knock can be heard at the door. This is never a good sign, especially when in an isolated vacation home in the woods. This is a fear perpetuated by the media every day, the fear that at any given moment, someone out there wants to do you harm just for the hell of it. It's enough to send chills down your spine. 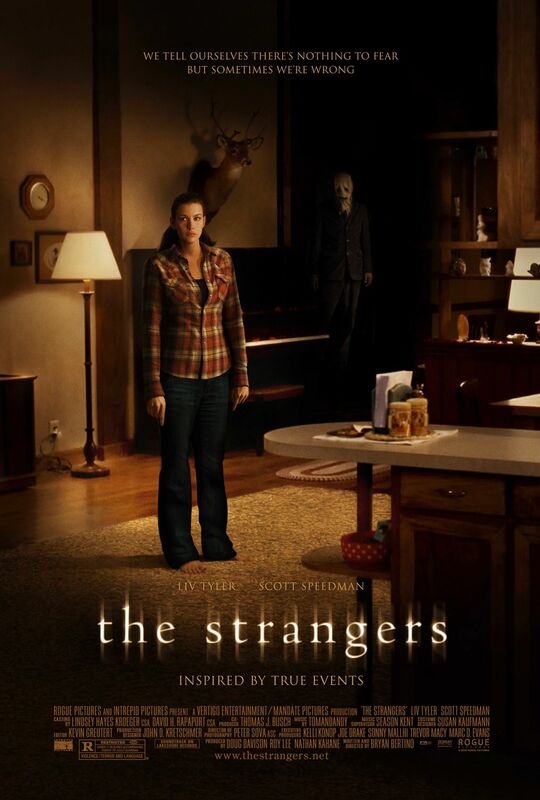 Writer/Director Bryan Bertino plays on these most basic fears in his movie "The Strangers." The film stars Liv Tyler and Scott Speedman as seemingly long-time couple Kristen McKay and James Hoyt. They have just returned home from a wedding reception. They have clearly been fighting as James's planned marriage proposal did not play out as expected. Unfortunately, neither does the rest of their night. As they hear a random knock on the door, they find a woman who is going door to door supposedly looking for someone. A short time later, she and two other people in masks randomly decide they want to harass this couple for seemingly no reason. It turns what was already a rocky night into an even deadlier one. Unsettling tension is the name of the game in "The Strangers." This film is built on the most basic concept imaginable but is very effective for the most part. The three strangers have a very simplistic look. One of them has a standard burlap sack over their head, and the other two are wearing baby doll and pinup girl masks. The film centers around their entirely random act of violence that, in many ways, is the most frightening fear of all. Random acts like this are often associated with serial killers and cults like The Manson Family. There are loud noises here and there that will make you jump, but they are never cheap or unnecessary jump scares. The jump scares are always within the context of the story and it's never some random raccoon jumping on trash cans making a loud bang. Most of the terror comes from the attackers being present in the room in plain sight while our protagonist is unaware of it. The movie does start to fall into typical tropes midway through its runtime as people separate from one another. They also fail to call the police and never really get the hell out of there. Of course, without these tropes, there would be no movie at all. The killers also seem to have this unique ability to vanish at the drop of a hat or cover very large spans of distance quickly and silently. We can't say Liv Tyler or Scott Speedman are all that impressive as far as their performance goes, but they are more than serviceable as they have to act out the scared and sometimes dumb actions of these characters. There are some genuine scares in "The Strangers," and we found ourselves on the edge of the seat several times while watching it. Director Bryan Bertino tries to keep the tension high for most of the film, so that's a huge plus. It probably helps the scare factor that we watched this late at night and our dog started furiously barking at the back door as if we had an unwelcome visitor.